Piles of sand, packed by gentle hands, formed a huge sandcastle on the beach. Twenty young men and women worked all day long building the monstrous mound and forming it into a massive castle of turrets, doorways and windows. When night came, they went home, leaving behind their buckets and shovels. “The left the buckets and shovels. Let's fill them up and add to it. The tide is going to come in soon and wash it all away. Do you want to?” Brad picked up a shovel. Just then a wave rushed onto the beach. “The tide is coming in now.” Brad sighed and watched the incoming waves taking the castle apart grain by grain and carrying it out to sea. Sea gulls hovered above, screeching and diving into the water to catch fish. Soon there was only half a castle, then a fourth and then it was gone. The water lapped at Brad and Chad's feet. The buckets were carried out to sea, bobbing empty on the waves. “Good idea, Chad. You're right. As long as there are waves, there will be sand.” Brad picked up a few sea shells and the two of them went home. 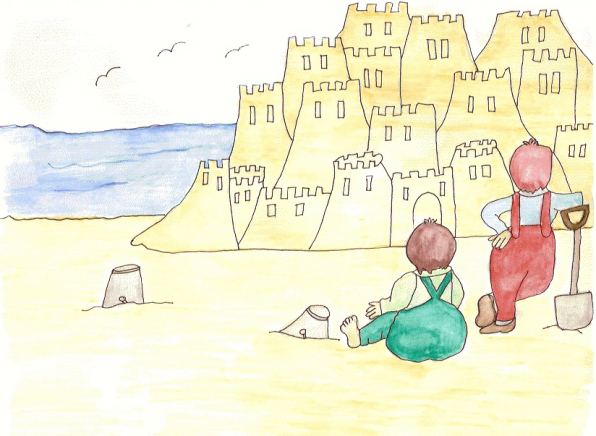 As he lay in bed that night he thought about what the next sandcastle would look like. Chad dreamed the same thing.